Don’t have the handset and the reader too close together. Bluetooth was interfering with the WiFi. They’re on the same frequency, and Bluetooth doesn’t really play nice with 802.11n. While the Internet connection was being blocked by the reader, the App became unstable on loading. Either turn on the reader before you start the App, or afterwards. I’m not completely sure of the timing, but there seems to be a bad spot if they’re both starting up together where they fail to sync and both go funky deux. The photographs following the review show what I mean! When you turn on the reader, wait for the “Please wait….” to disappear before you considering it to be “on”. i.e. 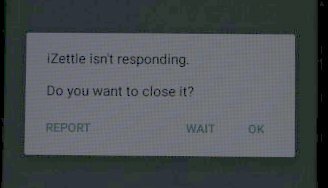 don’t start the App while it’s in that state, and don’t do anything to try to use it if the App is already running. If you follow the rules above, everything else works like a charm. And like all rules, there are exceptions when it might work anyway. 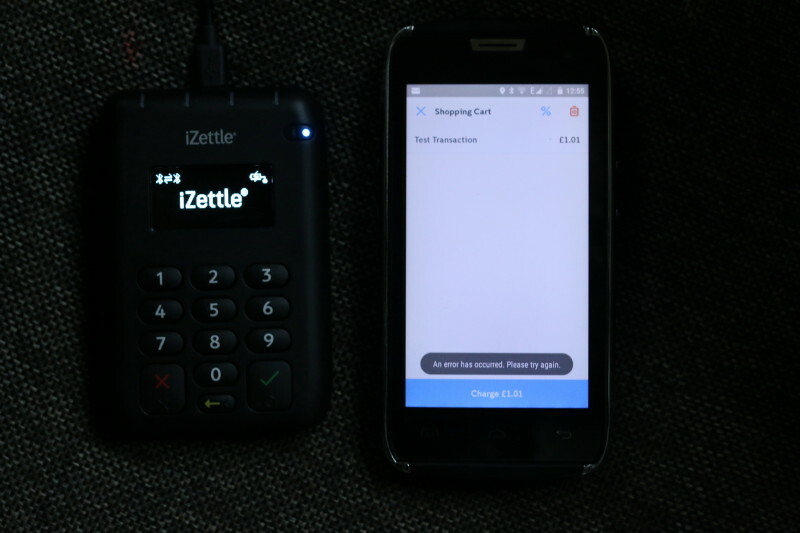 iZettle is a Swedish company, founded in 2010, offering a complete mobile card payment system for small businesses with Terms of Business and charges that should make the bankers blush. The deal is that they charge a straight ~1.5%-3% dependent on volume, with no minimum transaction fee. You can buy a reader from them, or if your volumes are high enough, they’ll give you a free Chip and Pin reader that connects to some smartphone/tablet hardware (iPhones and a few Android devices) using the microphone/speaker. My advice on the free reader is “don’t be cheap – pay for the bluetooth one”. 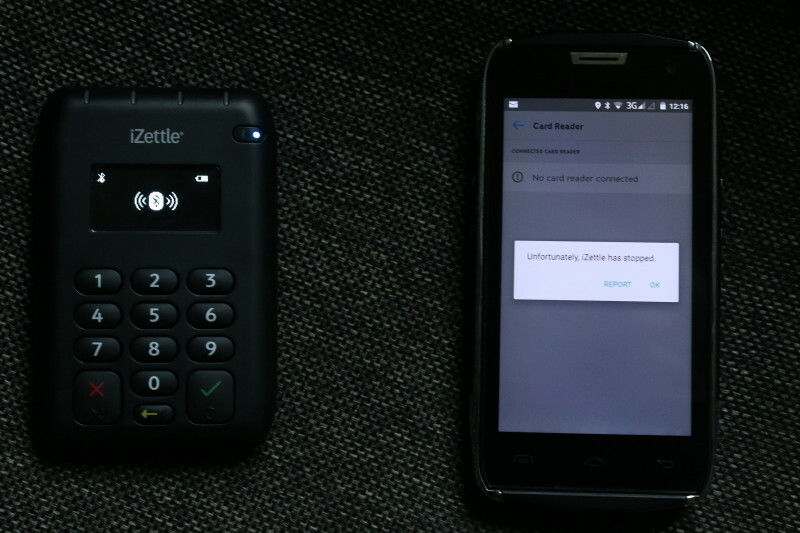 Today iZettle released its all-new Android App, version 3.0.0, which allows it to work with the Card Reader Pro Contactless . When I say “released”, it appeared in the Google Play store without fanfare; not even a press release. Apple fanbois have been able to use contactless cards (and Apple Pray) for some time now, but the Android App has always lagged behind; odd, as 90% of smartphones run Android. Perhaps iZettle really likes Objective ‘C’? The good news, apart from contactless support, is that the new Android App is much cleaner and nicer to use than the old one. On startup, it goes straight in to the screen where all you need do is enter the amount and optional description and add it to a cart (you can’t charge it immediately, for some reason). If you have pre-set items you can access them in grid or list from by swiping left; tapping an item adds it to the cart. To take a payment just tap on the cart icon. You get a chance to add a percentage or set value discount and when you’re done it just connects to the card reader and does the business. One very welcome feature is that the display on the reader now shows the amount being charged. There are other good features lying about in the software. For example, a battery status indication is available in settings. But the main feature of 3.0 is its ease of use. Teething problems connecting notwithstanding, there are a few possible improvements that spring to mind. It would be handy to be able to enter a number and select “Charge” immediately without going through the cart first. This may be a bug – before you enter an amount the there is a large button marked “Charge” that changes to “Add Item” (to the cart) as soon as you enter something. Also, there are pre-set discount rates of 5%, 10% and 15% and the ability to enter any percentage manually, but you can’t edit the pre-sets. More seriously, you can’t edit the VAT rate table or enter a manual rate. It has 0%, 5% and 20%, which are the current rates in the UK, but they’re going to change. It also makes no differentiation between Zero-rate an Exempt, which does matter for proper accounting. But these are minor quibbles. iZettle 3.0 is a big improvement on the rather clunky 2.5 and I’ve no doubt the teething troubles with the connection will be fixed. In the mean time, just leave the reader enough time to warm up. In view of the problems I did have, a means of rolling back updates is needed. 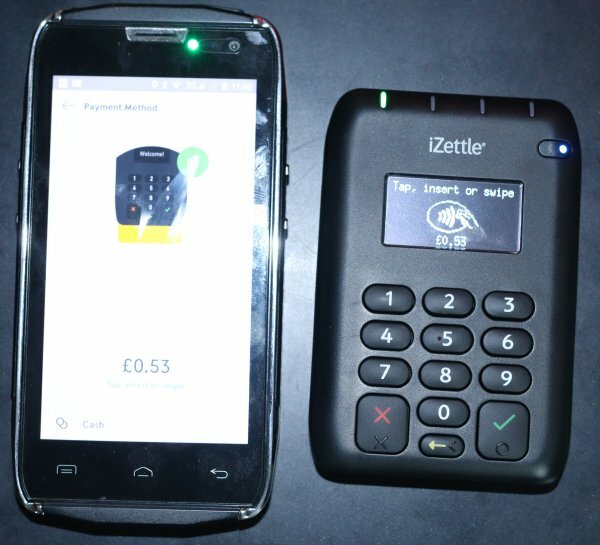 iZettle says that they can’t do this at the moment, but given the difficulty of testing Apps – especially Android ones – on the wide range of hardware and OS versions out there, relying on a compatibility list is a bad idea tactically. There’s a danger that people will seek to download older versions of the App if they encounter problems, and a bit of research this morning turned up a few .apk files on the Internet that had definitely been tampered with. 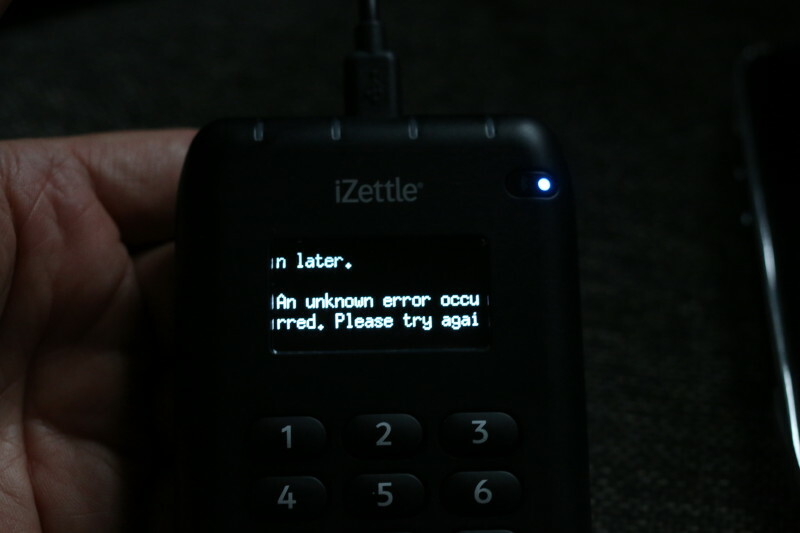 I’m trying to persuade iZettle to implement a rollback option but no luck yet. Rogues gallery: iZettle 3.0.0 going mad yesterday. See update above. 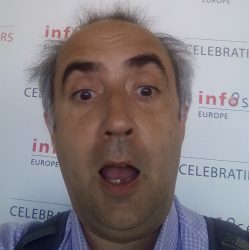 If you get the timing wrong or something interferes with the Internet connection (e.g. it’s masked by bluetooth) you could be in for a world of pain. Whenever I try to make a charge it either says that an “Unexpected error occurred – try again”, or it crashes out. This is before it even gets to the “insert card” part. And it’s really flaky when it comes to keeping bluetooth contact with the reader. It randomly freezes, in the case of the above while it was moving between screens – it appears to be when its thinking about bluetooth connections. It even manages to crash the reader itself! 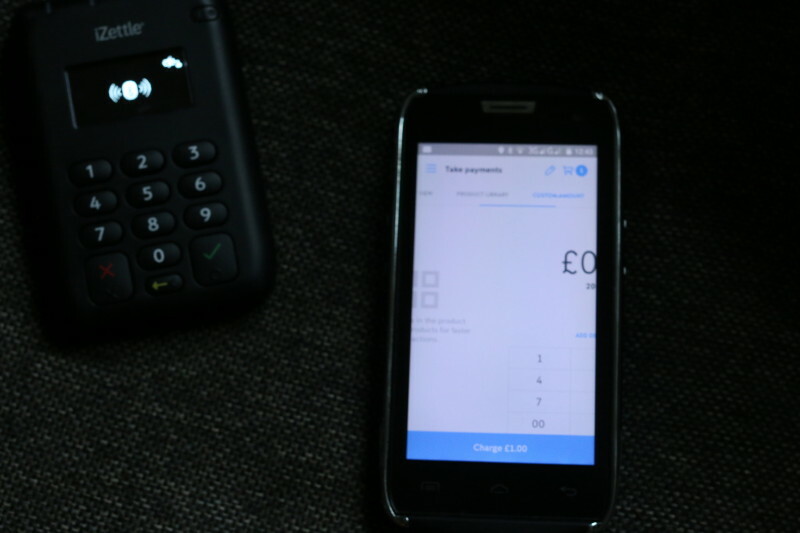 For what it’s worth, I’m using Android 5.0, and it worked just fine (albeit Chip and Pin) on the old version of the App. Fortunately I don’t process a lot of payments, so can live without it but others may be having a really bad day as a result. I’m having the same issue. I bought the bluetooth version because the free blue one didn’t work on my phone and everything was okay until up upgraded. Where can I get the old version? iZettle has been in touch – asking if my device is on their very limited “compatible” list. I’m not having any of that! However, I’m trying to find out if there is a secure place to get hold of the previous version. I really recommend not downloading it from any of the sites you get if you do a Google search. You could be downloading anything.